The world’s most popular polyurethane foam earplug, MAX offers superior noise-blocking performance in a disposable earplug. 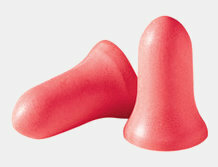 MAX's enhanced contoured shape is easier to insert and resists backing out of the ear canal, while its softer foam delivers superior long-wearing comfort. MAX earplugs offer solid performance that you can depend on and the highest protection level in the industry with an NRR of 33. Made in USA By Howard Leight Inc.